Looking for Guest Writer and Blogging Opportunities? At CMather Web Development we pride ourselves on staying current with functional and ongoing content for our readers. Some of our expert guest writers provide advice, tips and current technology news to our readers. If you’re considering becoming a guest writer, or a blogger on our site, please read the information below. Web Hosting / cPanel/ VPN / Servers. Search Engine Optimisation and Marketing. Project Management and Small Business Topics. “The most important concern is that the guest writer shows the information contained within the article be useful, engaging and beneficial to our readers.” Articles should be written from the perspective of an expert such as a specialist, a professional, an author or a craftsman. We are not looking for articles that are filled with superficial fluff, articles that are little more than a mechanised ‘How-To,’ or articles containing useless information. We are looking for good, compelling content that will resonate with the readers and articles containing reliable working knowledge that are both unique and valuable for our readers. If you are unsure whether your content will fit in with our style, please read some of our content to get an idea of the type of work that we publish. 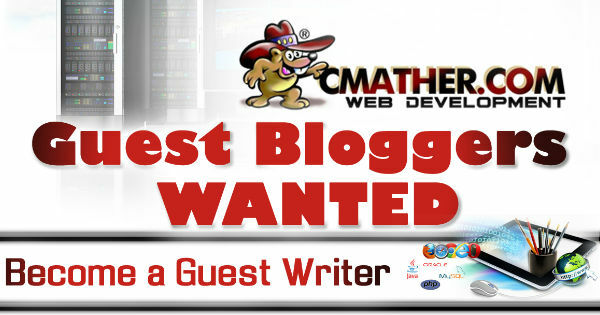 What Will Guest Writers and Bloggers Gain By Writing For CMather? Exposure to an existing readership that visits us consistently to obtain high quality information. The opportunity to build a portfolio of published and professional content. A link to your personal website, book page or blog. (Custom Author Box). The ability to showcase both your knowledge and your expertise in your niche market or field. Be indexed quickly on major search engines and added to social media sites. Before submitting an article for approval, please read and understand the below copy-writing guidelines. We only approve articles that are 100% original and unique works. This means that the work cannot be published anywhere else on the Internet, even if you have a byline for the former publication. Please note that we will verify originality using several methods online. Articles must be at least 500 words in length. Articles must contain valuable information or educational content such as strategies, tips, case studies, commentary opinions, and techniques. Every article must contain a character summary of no more than 160 characters, including spaces. Articles should contain numbered lists and bullets where appropriate. Articles must not be promotional content or contain product pitches. Use subsections and sub headings within your article. Use shorter paragraphs to ensure the article flows well, with one idea expressed within each paragraph. Be sure that the body of the article delivers on any promise made within the title of the article. There may only be one link within your article to your blog, website, your Amazon book page, your Facebook page, your Twitter account, etc. Links by default within an article body will carry a “nofollow” relevance tag. All article submissions must be grammatically correct, typo-free and otherwise suitable for Australian publication standards. That you understand our Article Copy writing Guidelines and that you shall be bound by them. That CMather may take as long as 4 weeks to review article submissions from guest writers. That CMather has sole discretion to accept or to reject submitted materials from guest writers. That CMather may add links to your submitted materials where relevant and may also edit or alter any submitted materials prior to publication. CMather shall make the sole determination of which article submissions shall be published. CMather shall have the sole discretion to make all decisions regarding all aspects of publication. Guest Writers: Please fill out the article submission form above and send to our Editor as a Word Document or TEXT Attachment.